Want only soft, IMO-Certified Organic Cotton jersey touching your baby’s skin? 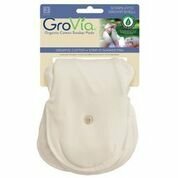 GroVia Organic Cotton Soaker Pads are truly pure and natural. A “two-ply” design speeds dryer time, true elastic leg gussets contain messes, and a waterproof backing keeps your GroVia Shells clean and dry. Snaps perfectly into place from 8-30+ lbs. Pairs perfectly with the GroVia Hybrid Cloth Diaper Shell.